Need more information about booking Home 9458081 ? A lovely, homely, holiday apartment with two spacious bedrooms (one en suite) and two shower rooms. There is also a large comfortable sofa bed in the living area, a fully equipped kitchen / dining area and a utility area. Fully air conditioned. The property is tastefully furnished with many pieces hand made by local craftsmen and much original local art. The apartment is right in the old town, but set back from the road in a small gated complex, so it's quiet and secluded but just a couple of minutes stroll from the cobbled streets, craft shops and restaurants. You can easily reach the harbour and town beach in less than five minutes, so no need for any expensive Kalkan taxis! 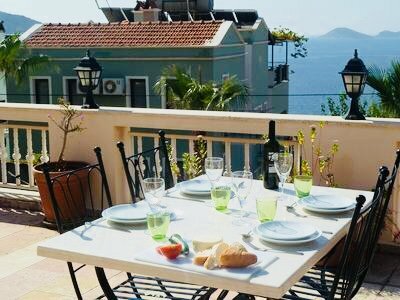 We have a property manager in Kalkan who will be able to answer any questions you have and help with any problems. He can also set up car hire / airport transfers for you too, if required. If you prefer to do it all yourself - that is fine! If you don't need any help whilst you're there, then you can enjoy your own space.